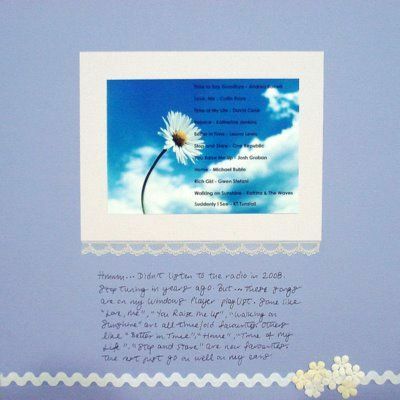 This scrapbooking idea is an easy and simple one. 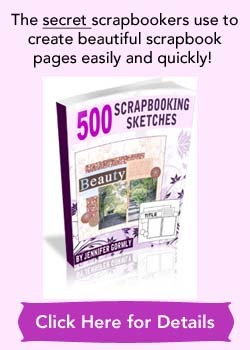 Yet it lets you document in your scrapbook page, a current list of your favorite songs or music you’ve been digging into. Maybe you hardly listen to music and could count your favorites with five fingers. That’s alright. Get them down. Maybe you’re a music junkie and your latest list runs into hundreds or even thousands and span over a number of genres! Ah… Then it’s a good idea to prune down your list to your best favorites or most listened to. What songs get you swaying your head to the rhythm? What tunes make your mind go into the sweet memories of the past? What genres of music you really go for? Favorite singers or albums? This year, I don’t have a playlist. I spent majority of my time listening to affirmation CDs… But I did have a list last year. This layout was created last year and as I looked at the creation date, it’s a year ago. Looking at my short list now, I could see a few songs I’ve liked for years while several were “hits of the year” for me. Still this playlist reflects my enjoyment in certain songs at a particular stage of my life. Go on, get your playlist down on a beautiful or funky page! Years later, it’ll be fun to see how your taste in music has changed or remained the same. 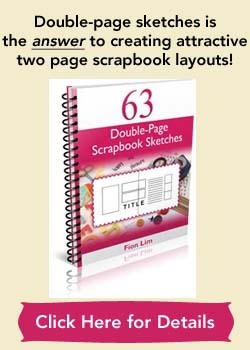 Do browse through this website for more scrapbook page ideas! Supplies used: Cardstocks – Bazzill Basics; Lace ribbon – Daiso Japan; Paper flowers – Prima Marketing, White ric-rac – from stash; Black pen – Zig Memory System “Millennium”. Photo credit: Daisy by SteveFE from Stock.xchng.